Finally, we are having almost the last of the wallpaper stripped from house (check out that wallpaper!). 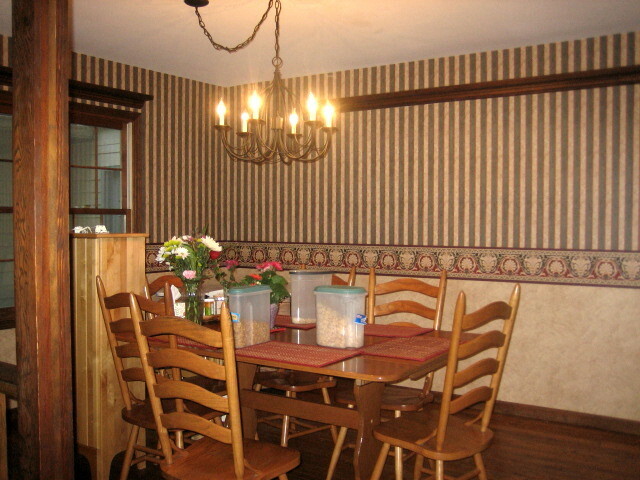 When we bought the house back in 2001, every spot of available wall space with the exception of the downstairs bathroom, master bedroom and master bathroom was covered in wallpaper. 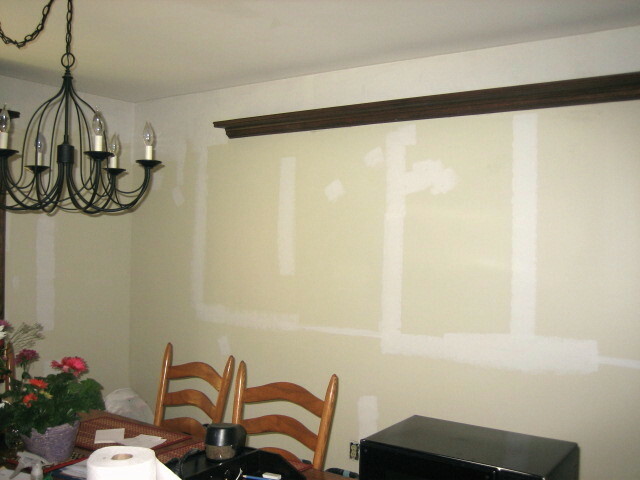 The prior owners clearly hated paint for some reason (Maybe the fumes? Couldn’t find the right color? Not enough pattern?). Now that the kitchen/dining area has been stripped, there are 3 rooms left: the office (it’s so hideous, but we can close the door and hide it from guests), the kids’ bathroom and the laundry room. If the office is so hideous, why haven’t we done anything with it? Well, because the office will snowball into another big project because the window treatment and carpet will have to go as well as the wallpaper. Uh. . . . .I don’t want to talk about it right now. Back to my kitchen! I’m so excited!! After weeks of trying to convince my husband that my vision for my (I mean our) kitchen will be amazing, it’s finally happening. 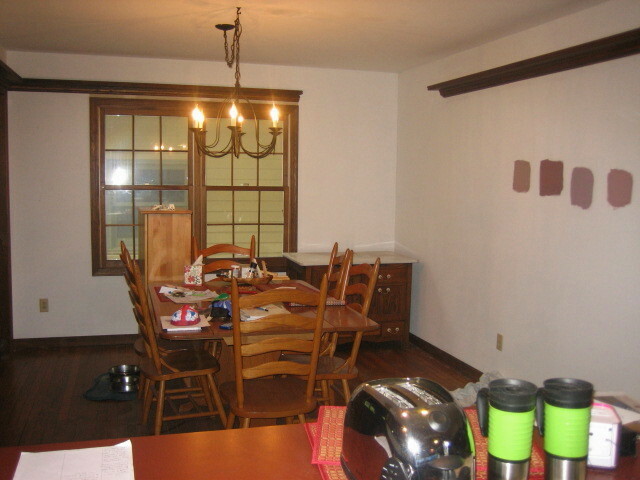 We are getting new walls, new countertops and refinished hardwood floors. 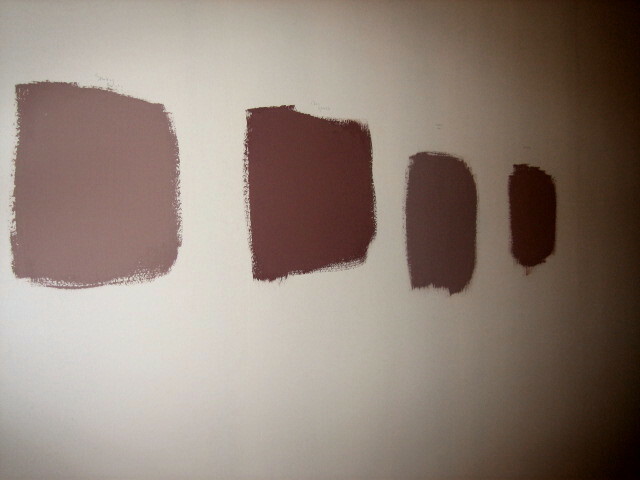 I had to fight for my walls though – I wanted a warm, purplish color. Mike was really resistant – he was afraid that the paint color would be lavenderish. I finally went out and picked out the color that I had floating in my brain (my husband would come back with samples, but they just weren’t right and the ones he picked out were freaking him out!). The color was hard to describe, but I finally found it and it has a name – Gothic Amethyst (Porter Paint). Cool name, right? We are also considering Smoky Quartz (it’s very similar, but a little warmer). Now that Mike has seen my vision of “purple”, he’s onboard. I just had to convince him that it wasn’t going to be lavender (yuck!). Check out the colors on the Porter Paint Color Palette. What do you think? Which color? 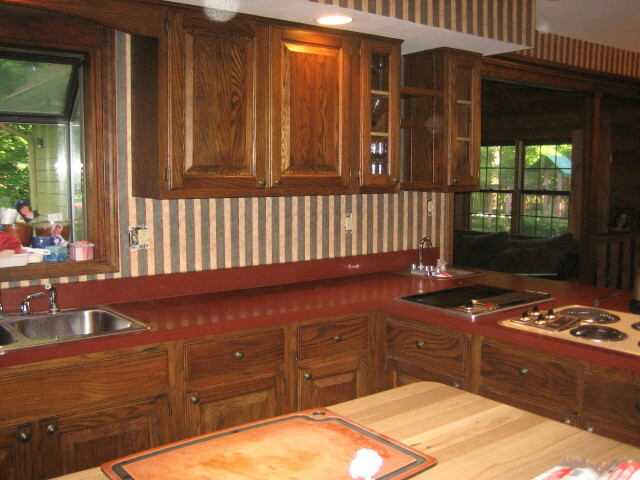 The countertops took about as long as the color – we have selected Santa Cecilia Granite for the bulk of the countertops with Cambria Quartz – Branbury (Quarry Collection – it’s reddish brown) for the island. We will have new countertops next Wednesday and new paint next Thursday. However, I guess when you consider what we have been living with, anything would be better, right? 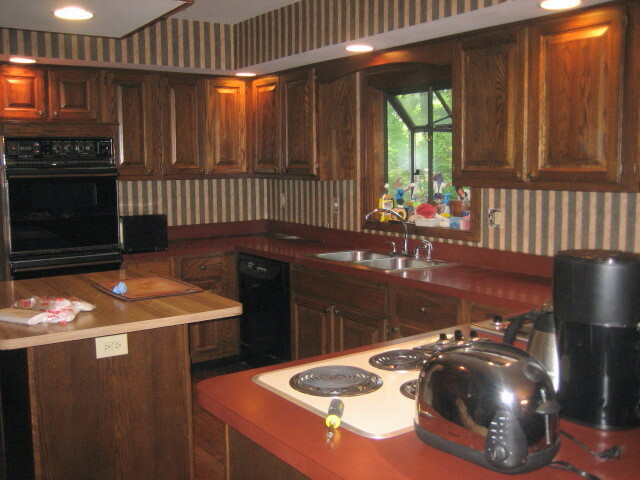 This entry was posted in Everyday Life and tagged cambria quartz, granite, kitchen remodel, paint colors, porter paints, postaweek2011, quartz. Bookmark the permalink. Well, good luck with the renovation…I like the first shade of brown (on the left handside…) Let us know how it goes! I think that’s the shade we are going with! 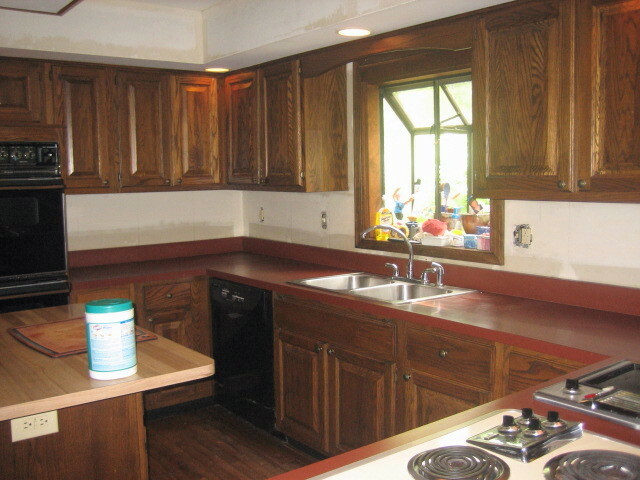 I will post pictures of my completed kitchen next week. I’m really excited! I know you fought for your colors but just a thought…. 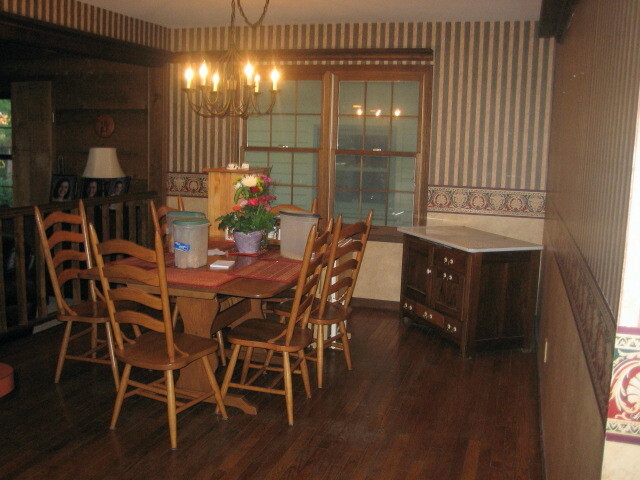 from my experience….because you have the warm stained cabinets, warm stained floors, and now getting warm counters…. you might consider a contrast paint color… perhaps in the green family……then make all of your accessories in the purples and they will pop off of the walls. Although you may prefer the purple… I know when I have already decided…it cannot be vetoed! Just thought I’d offer from another set of eyes! Good Luck! Wow, you have my story beat. We did not have wallpaper on the ceilings! That is crazy. I love my new kitchen – I really enjoy just standing in it!